← Focus on DERA (Digital Education Resource Archive): School Meals. We’d like to welcome all new and returning students to the IOE Library. We have wonderful collections, a vast range of online resources and knowledgeable staff whom you can get acquainted with in three ways below. #1. IOE LibGuides. The dependable IOE LibGuides continue to provide essential and current information about collections, services, archives and how to advice. The companion to LibGuides, IOE LibAnswers, is a database of previously asked questions which offers an enquiry service via email, phone, text and Twitter. Both LibGuides and LibAnswers provide a great deal of the information used in library sessions so if you’re new to UCL, review the guides and check out the Getting Started LibGuide which covers the basics for getting started in library and IT. #2. Explore. UCL Explore is UCL Library Services’ single search tool for finding journals, books, full-text articles, archive material, etc. You can find much more advice and a video about searching the upgraded Explore on LibGuides. You may also be interested in booking a Wednesday workshop on getting the most out Explore here. #3. IOE Library. We would urge you come in and have look around the library which houses a number of library collections as well as pc labs and study spaces. You will soon find a new IOE Map in the library to help you get orientated to the collections and zones. More information about social, collaborative and quiet zones can be found on the Finding LibGuide here. We hope this gets you started, but keep in mind that there is a lot more that IOE and other UCL libraries can offer. UCL-wide pages, LibrarySkills @ UCL, for getting started and training can be found here. 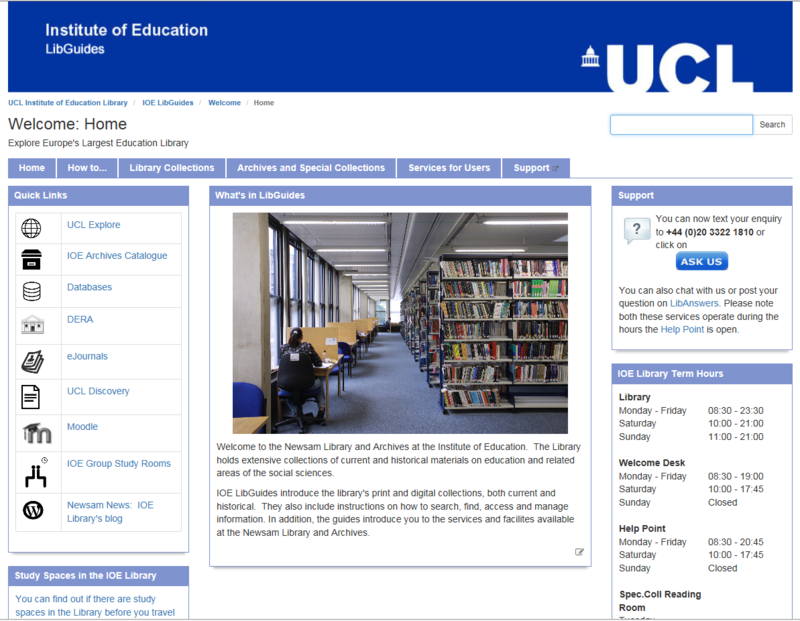 This entry was posted in Library and Archives, UCL Library Services and tagged information literacy, IOE floor plan, IOE LibAnswers, IOE LibGuides, IOE Library, training, UCL Explore. Bookmark the permalink.